All orders need to be created in Brightpearl to ensure accurate inventory, sales and accounting data. A new order can be started by looking up an existing customer, or by adding a new customer. Products and services can be added to an order by looking up the name, SKU or product ID and miscellaneous charges can be added by typing manual order rows. The products which can be added to the order must have a status of "Live" and must be within the current Season (if active). Pop-up messages can be added to customers and products to create alerts to users when creating creating orders manually. For example, when a credit customer is on-hold a message can be added to the customer record which will alert the user to the reason if a new order is attempted. Or a sales message can be added to a product will be discontinued after all the existing stock is sold, warning the user not to place any of the product on back order. 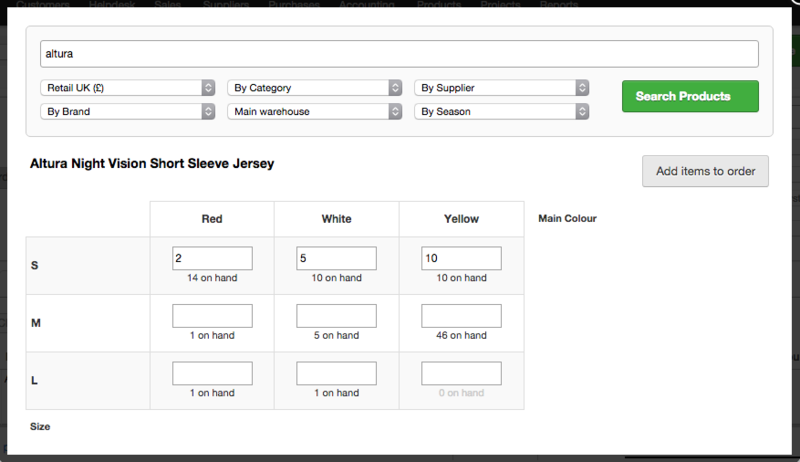 Sales orders can be imported into Brightpearl from an Excel spreadsheet. They can be imported as unpaid, or they can be marked as paid during the same process. It is not possible to import the payments separately later. Customers will be created during the import process, or existing customers can be matched by email address or account code. The imported file can contain only fields supported by Brightpearl (as listed below) - where additional fields are included consider creating a custom field in Brightpearl or removing it from the spreadsheet. Column headings must match the name of the Brightpearl field, as listed in the table below. Cells should contain only the data relevant to a particular field, for example, a full address cannot be entered into a single cell it must be split across multiple columns for "Street", "Suburb", "City" etc. Each line item of an order (i.e. product) must be recorded as a separate row in the spreadsheet. An order reference is required in order to group each row into a single order in Brightpearl - apply the same reference to each row. The first column must always be "Order ref" or the import will fail. The order reference must be unique for each order in the spreadsheet as well as across orders that already exist in Brightpearl. An import file must be saved as an .xls file type - Excel 97-2003. Where a matching SKU is found in Brightpearl the product will be added to the order. If this field is left blank a miscellaneous line item (free text) will be added. Item net Not supported - please use item gross to ensure correct VAT rounding. This will add an additional line item called "Shipping". Use either shipping net or gross. If both are added one will be ignored. The shipping charge applicable to the whole order must be entered against a single row. If multiple rows for the same order have a shipping charge entered only the first value listed is used. Order total This will be used to display the order total for the entire order. Date time This will be used as the creation date and time and tax date. It must be formatted as a date field to display: YYYY-MM-DD hh:mm:ss. If not included the date and time the import is performed will be used. Date This will be used as the creation and tax date. It must be formatted as a date field to display: YYYY-MM-DD. Comments This entry will be added as a comment in the notes and payment history on the order. These details will be used to create a new customer record where no existing record can be found (by matching email). If an existing customer record is matched by email address the order will be added to the customer account, but these address details will be applied to the order. The customer record will not be updated. Customer country must be the country name, not ISO country code. These details will always be used as the delivery name and address for the order even if an existing customer record is matched by email with a different delivery address. An existing customer record will not be updated with a new delivery address. If these fields are not included, or are included but left blank the customer details (as above) will be used. Delivery country must be the country name, not ISO country code. These details will always be used as the billing name and address for the order even if an existing customer record is matched by email with a different delivery address. An existing customer record will not be updated with a new delivery address. Billing country must be the country name, not ISO country code. All four of these columns must be included to receipt a payment against the order. Enter the amount to be posted in the base currency. The date can be entered as DD/MM/YYYY or MM/DD/YYYY (depending on what you have specified in Settings > Company > Other options). Enter a reference for the payment and the account (nominal) code into which is should be posted (must exist in your chart of accounts as a bank account). Note that payments can only be imported at the same time as the order. 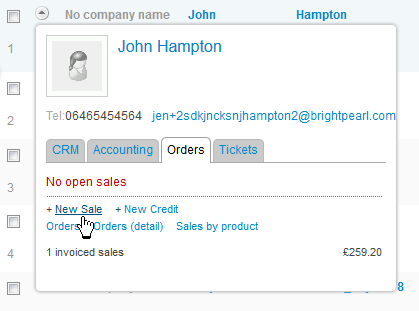 PCF_* Custom fields can be populated on sales orders where they pre-exist in Brightpearl. The column heading must begin "PCF_" followed by the custom field code, e.g. "PCF_CODE". The spreadsheet for import must included at least one of "Item tax code", "Item tax amount", or it can include both. Item tax amount column included? Item tax code column included? No No The whole import will fail. Note: When the tax amount has been applied by the "Item tax amount field" and not calculated from a tax code it is represented as manual tax visible as a tax amount field shaded yellow on the sales order row. A data map is used to read the spreadsheet - it is a list of all the columns that are included in the spreadsheet and the order that they are in. Only fields supported by Brightpearl can be imported - where a matching field is not available consider creating a custom field or removing it from your spreadsheet. Once a data map has been created it can be used every time a file of the same mapping is imported. Data maps can be copied and edited for variations of import files. To add a new data map for your import go to Settings > Data / Import, and select the relevant import routine - accounts, products, customers/suppliers or orders (for both sales and purchases). The new data map is listed. Click Import to begin importing your data. Before attempting the import of the data we recommend doing a test run to check for any errors. Leave the first box unchecked to perform a test import to check for errors without creating or amending any data. If you wish to receive an email report of the import - includes errors, number of records read/created etc. Browse for and select your saved file. Click the Upload XLS file button. Any errors will be shown at the top of the screen and in the email report. If the same problem occurs for every line the error will be repeated for each one. No data will be created. To see your imported orders go to Sales > Recent sales orders. Brightpearl EPOS orders will automatically show in the Brightpearl back office. They do not require processing in back office since they will be completed automatically by processes performed in EPOS. All EPOS sales will automatically be assigned to the relevant EPOS sales channel for identification and reporting. Orders from connected sales channels (such as eBay or Amazon or a website) are automatically downloaded into Brightpearl so that they are all processed in the same way and in the same place. A sales channel can be connected using a Brightpearl app, a third party developer app, or a private/custom built app. 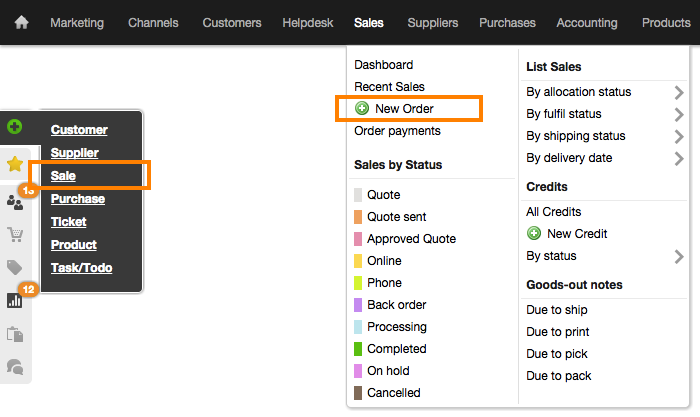 Orders are automatically assigned to the channel from which they came, allowing you to prioritize and report on them as required. Magento Every 7.5 minutes Yes Each download checks for orders made within the last 7 days.